Janet Napolitano knows a few things about immigration and border security. 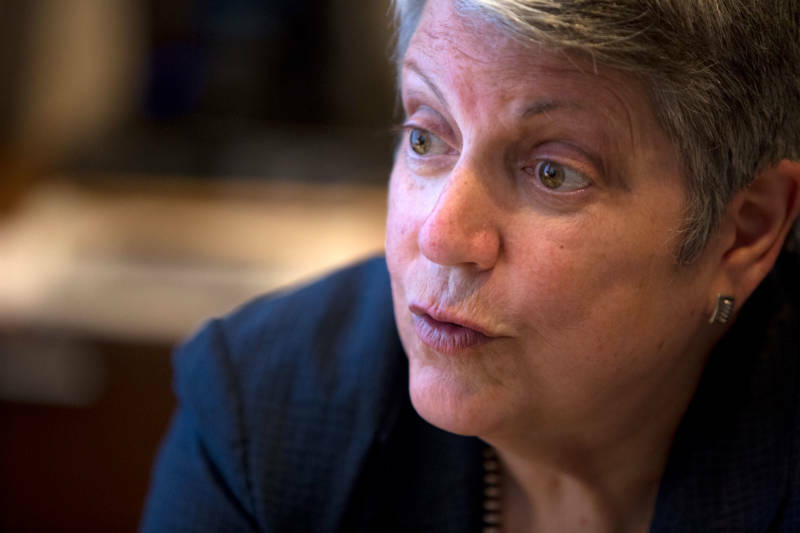 Before she became president of the University of California in 2013, Napolitano served as secretary of the Department of Homeland Security under President Barack Obama. Before that, she governed Arizona. 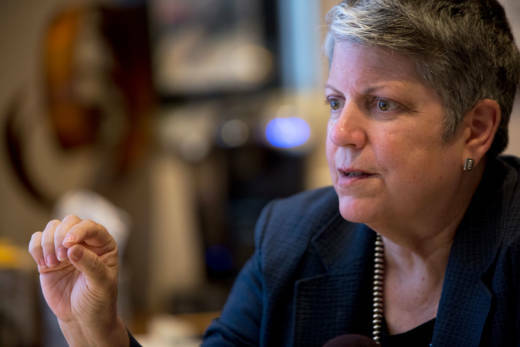 The California Report sat down with Napolitano in her Oakland office last week for a wide-ranging conversation, from the Trump administration's zero-tolerance migration policy to border walls and DACA. Napolitano confirmed that, like the Trump administration, the Obama administration also had considered separating migrant families to deter parents from crossing into the United States illegally with their children. But, she said, under Obama the idea was a nonstarter. "It was quickly discarded," she said. "It's just not consistent with what we thought wise immigration actions would be. And also with our values." Napolitano admitted to being angered upon witnessing family separations taking place under the Trump administration's zero tolerance policy. But as the former head of a Cabinet department, she also noticed something else: a total lack of planning. "You could just tell that the three agencies that were involved -- the Department of Justice, the Department of Homeland Security and the Department of Health and Human Services -- had done no preplanning for this," Napolitano said. "[They] had no system in place for how they were going to keep families and children ... parents and children ... in touch with each other, even if they were to be separated, which they shouldn't have been separated to begin with, or how to bring them together," she said. "And so now they're trying frantically because the courts are making them, and the court of public opinion is making them, to knit together a system [that] at the very least should have been thought through ahead of time." What tipped Napolitano off to the Trump administration's lack of planning? "Well, first of all the announcement by the attorney general that we're going to do zero tolerance, and the effect on law enforcement ... [was] that you've got to pull federal prosecutors off of doing serious drug smuggling, human trafficking, gunrunning cases to do what are at most federal misdemeanors. "The other thing that tipped me off was the fact that once you put the adults into the criminal justice system, the children can't go there. So that must have required separation. And yet there seemed to be no appreciation in Washington about how the one thing -- the zero tolerance policy -- led necessarily to the other. "And then the third thing was the obvious scramble to find safe, child-amenable housing for the children who were separated. So you had horrible pictures on TV of these places that were never designed to keep large numbers of children for an extended period," Napolitano said. One of the goals of the Trump administration's zero tolerance policy is to deter people trying to cross into the U.S. illegally. Napolitano doesn't see that as a reasonable strategy. "I think a deterrence-based strategy when people are migrating out of desperation doesn't really work," Napolitano said. "It may deter a few people at the margins, but when the factors contributing to the migration are widespread and serious, I don't think justifying a zero tolerance policy as a deterrent actually works." Meanwhile, the Trump administration has pointed to an Arizona policy implemented while Napolitano was governor as a reason to build a border wall. In 2005, more than 800 people were arrested crossing into Yuma, Arizona, from Mexico. Congress approved a 20-foot-high, reinforced metal fence that stretches the length of Yuma. Crime immediately fell by double-digit rates in the area. Napolitano appeared with then-President George W. Bush and spoke in support of tough security measures. Since then, Napolitano has said that building a similar structure along the entire border would not work, a position she reiterated in her conversation with us. “The Yuma sector is a very small sector along the southwest border,” Napolitano said. Napolitano emphasized a more holistic approach to border security as one with the best chance for success. "We need to stop thinking about [border security] as simply a literal space, but really as a strategy that begins outside the borders of the United States, that includes the right level of manpower, the right kind of technology." Napolitano -- who helped implement the Deferred Action for Childhood Arrivals (DACA) program as DHS secretary -- sued President Trump last year to preserve the program. “I began DACA when I was secretary ... I take it personally,” she said. Napolitano said she took issue with Attorney General Jeff Sessions’ announcement rescinding DACA. While Sessions said that the rescission should not be seen as meaning DACA recipients are “bad people,” he also described DACA as a failure to enforce the laws. “Failure to enforce the laws in the past has put our nation at risk of crime, violence and even terrorism,” Sessions said. Yet, studies of DACA and DACA-age recipients show this group commits crime at a lower rate than native-born United States citizens. These findings have held even in surveys conducted by conservative think tanks. Napolitano also pushed back on Sessions' and Trump’s claim that DACA was an overreach of the Obama administration that violated the lawmaking process.